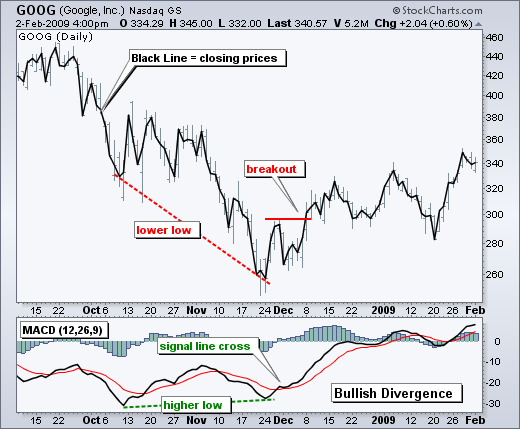 What is the Moving Average Convergence Divergence or MACD? The MACD is calculated by subtracting the 26-day exponential moving average (EMA) from the 12-day EMA. In addition to this line resulting from the difference between these two exponential moving averages, the nine-day EMA of the MACD, called “signal line”, is plotted on top of the MACD, functioning as a trigger for buy and sell signals. To complete the indicator chart, the MACD Histogram represents the difference between the MACD and its 9-day EMA, the Signal line: the histogram is positive when the MACD Line is above its Signal line and negative when the MACD Line is below its Signal line. The values of 12, 26 and 9 are the typical settings used with the MACD, however the parameters may be personalized with different values depending on the specific trading style and goals of the trader. Therefore MACD is at the same time a trend-following and momentum indicator. The shorter moving average (12-day) is faster, whilst the longer moving average (26-day) is slower and less reactive to price changes in the underlying security. A positive MACD indicates that the 12-day EMA is above the 26-day EMA; positive values increase as the shorter EMA diverges further from the longer EMA and this means upside momentum is increasing. A negative MACD indicates that the 12-day EMA is below the 26-day EMA; negative values increase as the shorter EMA diverges further below the longer EMA and this means downside momentum is increasing. In the example above, the yellow area shows the MACD Line in negative territory as the 12-day EMA trades below the 26-day EMA. The initial cross occurred at the end of September (black arrow) and the MACD moved further into negative territory as the 12-day EMA diverged further from the 26-day EMA. The orange area highlights a period of positive MACD values, which is when the 12-day EMA was above the 26-day EMA. Notice that the MACD Line remained below 1 during this period (red dotted line). This means the distance between the 12-day EMA and 26-day EMA was less than 1 point, which is not a big difference. When the MACD falls below the signal line, the trader should read it as a bearish signal and conversely when the MACD rises above the signal line, the indicator gives a bullish signal. Traders also watch for a move above or below the zero line because this signals the position of the short-term average relative to the long-term average. When the MACD is above zero, the short-term average is above the long-term average, which signals upward momentum; the opposite is true when the MACD is below zero. Also, the zero line often acts as an area of support and resistance for the indicator. When the security price diverges from the MACD this means the end of the current trend. Similarly to what happens with the RSI divergence, when the price new high is not confirmed by the MACD indicator new high, the trader should read this as a slow down of the upward momentum. Viceversa, when the new low of the price is not confirmed by a new low of the MACD the downside momentum is losing steam and a correction or the begin of a new uptrend must be considered. Signal line crossovers are the most common MACD signals. Being the moving average of the indicator, the signal line trails the MACD and makes it easier to spot MACD turns. 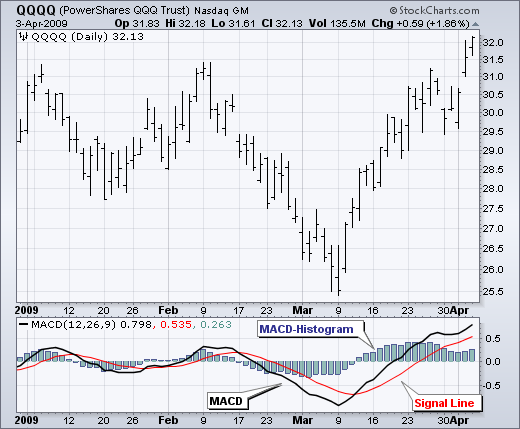 A bullish crossover occurs when the MACD crosses above the signal line. 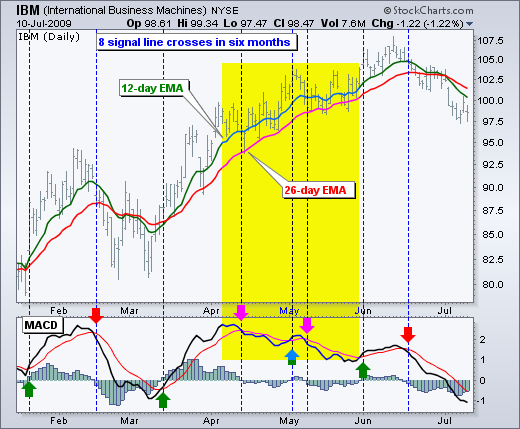 A bearish crossover occurs when the MACD crosses below the signal line. Due diligence is required before relying on these common signals. Signal line crossovers at positive or negative extremes should be viewed with caution; even though the MACD does not have upper and lower limits, chartists can estimate historical extremes with a simple visual assessment. After the crossover momentum is likely to slow and this will usually produce a signal line crossover, especially at the extremities, even if there is the possibility that the price continues to move in the same direction. 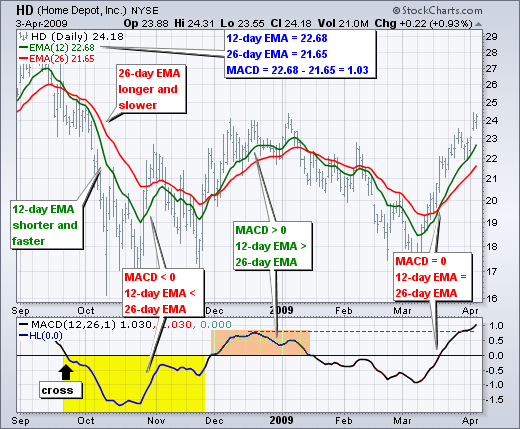 The chart below shows IBM with its 12-day EMA (green), 26-day EMA (red) and the 12,26,9 MACD in the indicator window. There were eight signal line crossovers in six months: four up and four down: some were good signals and some bad signals. The yellow area highlights a period when the MACD Line surged above the zero line to reach a positive extreme. Even after the two bearish signal line crossovers in April and May, IBM continued to move higher: upward momentum slowed down but it remained stronger than downside momentum. The third bearish signal line crossover in May resulted instead in a winning trade. Centerline crossovers are the next most common MACD signals. 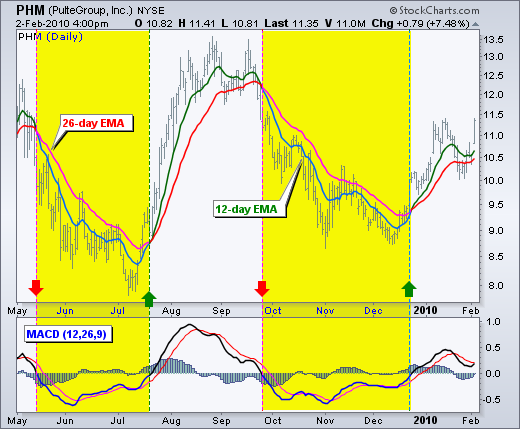 A bullish centerline crossover occurs when the MACD Line moves above the zero line, which happens when the 12-day EMA of the underlying security price moves above the 26-day EMA. A bearish centerline crossover occurs when the MACD moves below the zero line, which happens when the 12-day EMA moves below the 26-day EMA. The below chart shows Pulte Homes (PHM) with at least four centerline crosses in nine months. The resulting signals worked well because strong trends emerged with these centerline crossovers. 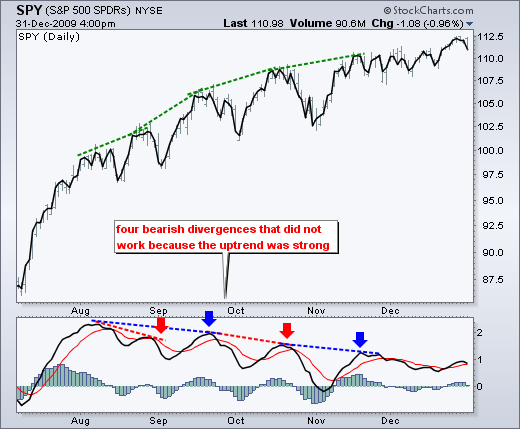 Divergences occur when the MACD diverges (moves differently) from the price action of the underlying security. A bullish divergence occurs when the price of a security records a lower low and the MACD forms a higher low. The lower low in the security confirms the current downtrend, but the higher low in the MACD shows less downside momentum. Despite less downside momentum, downside momentum still outpaces upside momentum as long as the MACD remains in negative territory. Slowing downside momentum can sometimes foreshadows a price correction or even a trend reversal. – Google confirmed a reversal with resistance breakout. Divergences should be taken with caution as bearish divergences are commonplace in a strong uptrend and bullish divergences occur often in a strong downtrend. Even though the uptrend continues, it continues at a slower pace that causes the MACD to decline from its highs. Upside momentum may not be as strong, but upside momentum is still outpacing downside momentum as long as the MACD Line is above zero. The opposite occurs at the beginning of a strong downtrend. The next chart shows the S&P 500 ETF (SPY) with four bearish divergences from August to November 2009. Despite less upside momentum, the ETF continued higher because the uptrend was strong. Notice how SPY continued its series of higher highs and higher lows. Remember, upside momentum is stronger (even if at a lower pace) than downside momentum as long as its MACD is positive, and downside momentum is stronger (even of at a lower pace) as long as MACD is negative. A bearish divergence forms when the price of the underlying asset records a higher high and the MACD forms a lower high. The higher high in the security is normal for an uptrend, but the lower high in the MACD shows less upside momentum. As said, even though upside momentum may be less, upside momentum is still outpacing downside momentum as long as the MACD is positive. Waning upward momentum can sometimes foreshadow a trend reversal or sizable decline. Below we see Gamestop (GME) with a large bearish divergence from August to October. The stock forged a higher high above 28, but the MACD Line fell short of its prior high and formed a lower high. The subsequent signal line crossover and support break in the MACD were bearish. On the price chart, notice how broken support turned into resistance on the throwback bounce in November (red dotted line). This throwback provided a second chance to sell or sell short. The MACD indicator brings together momentum and trend in one indicator and it can be applied to intraday, daily, weekly or monthly charts. Chartists looking for more sensitivity may try a shorter short-term moving average and a longer long-term moving average; for example, MACD(5,35,5) is more sensitive than MACD(12,26,9). Chartists looking for less sensitivity may consider lengthening the moving averages. A less sensitive MACD will still oscillate above/below zero, but the centerline crossovers and signal line crossovers will be less frequent. MACD does not have any upper or lower limits, and thus it is not particularly good for identifying overbought and oversold levels. 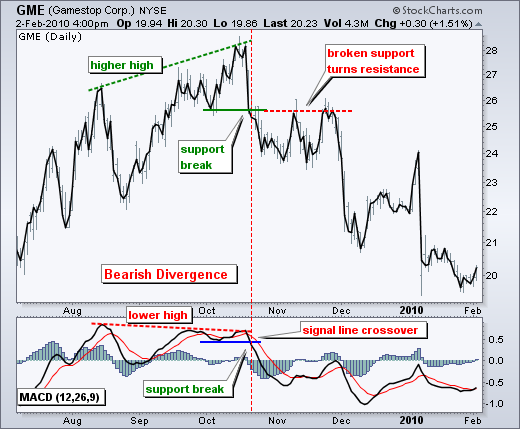 Eeven though it is always possible to identify levels that are historically overbought or oversold, the MACD can continue to over-extend beyond its historical extremes. Since MACD is calculated using two moving averages its values depend on the price of the underlying security: the MACD values for a $20 stocks may range from -1.5 to 1.5, while the MACD values for a $100 may range from -10 to +10. It is not possible to compare MACD values between two or more securities with different prices; in such a case, in order to compare momentum readings the Percentage Price Oscillator (PPO) is more suitable.